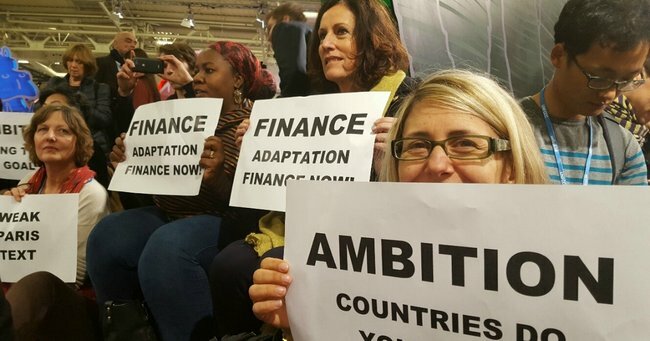 What really happened at the Paris climate talks. 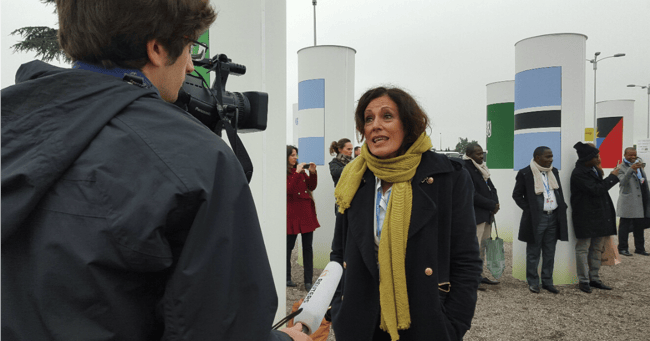 Helen Szoke, head of Oxfam Australia, has provided Mamamia with a journal of what happened during the Paris climate talks. Day by day, she reveals how the negotiations moved from a point of stagnancy to one of meaningful, substantial change. Arriving in Paris for the final week of the UN climate changes talks, there was an incredible sense of history in the making. Despite a week of long days and sleepless nights, the Oxfam delegation was in full flight, energised as the finish line to the long awaited possibility of a Paris Agreement was finally within sight. Paris is crisp and beautiful; but the military presence in the city is evident and a sobering reminder of tragedy that struck only two weeks ago. The sheer size and complexity of the talks is incredible; 55,000 people mill around the Le Bourget convention centre, never missing an opportunity to influence and persuade. There is everything needed to house a small city, from internet cafes to high-tech press centres to coffees carts to fuel around-the-clock negotiations. There are early signs that there will be an agreement, but what will be the ambition and scale? Will this actually make a difference for future generations? I met with Mr Xie Zhenhua, the China Climate Envoy, who is one of the most sought after negotiators, and of the position that developing countries should not have to pay for the excesses of the developed countries. President Tong of Kiribati made a heartfelt plea this evening, reminding us all of the dangers these tiny atolls face. “Our identity is our land and without our land we are nothing,” he said. There is much at stake for our partners –those communities in countries that are most affected by climate change and the least responsible – and that’s why we’re here, to make sure they have a voice. It’s great to see our Pacific Island colleagues here, proud and determined. 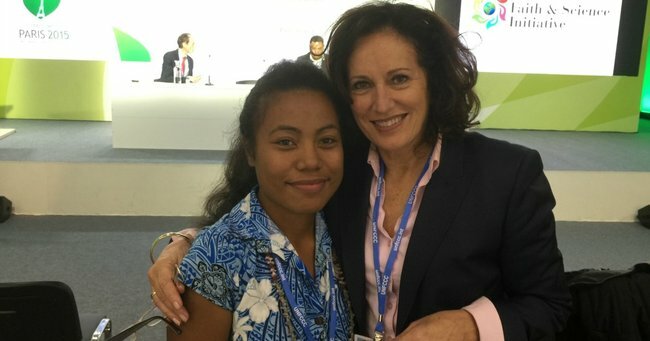 I caught up with Tinaai from Kiribati, a young woman who has travelled to Paris, holding press conferences and panel discussions to talk about the importance and dangers facing her home. She is an incredible inspiration, as she was when she lobbied our own politicians in Canberra in October. Hours before the release of a new draft, signs look grim. We’re very concerned over the direction the talks have seemingly taken. It looks like countries settling for what’s easiest to agree, instead of what’s right for their people and the planet. But it’s not too late to strengthen the deal. This is crunch time. The delivery of the first text was the catalyst of another sleepless night for the Oxfam team and our partners as they poured over the draft, looking at the technicality of the language. I had an amazing meeting with incredible women from Latin America who are part of a farmers’ activist network. They have chosen to raise their voices in countries where their rights are not guaranteed and where the impacts of climate change are felt every day of their lives. The Foreign Minister, Julie Bishop, hosted a private dinner with NGO, business and government representatives. She was irrepressibly buoyant and optimistic, and it was good to see a strong conviction for an agreement that was not yet clear. We’re worried – now the text has arrived there is no movement on key issues. This morning, I chaired a press conference with representatives from community organisations from across the globe in an effort to inject some urgency. 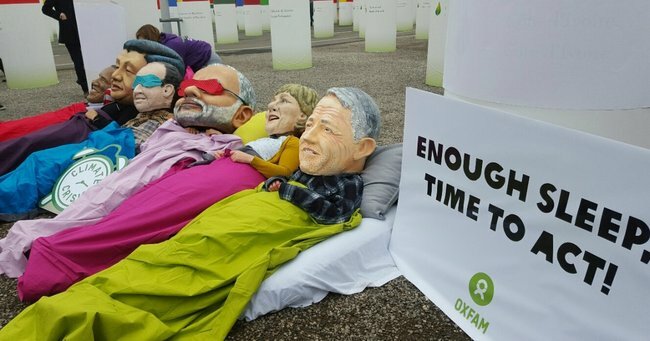 Oxfam brought out its signature ‘big heads’ – people wearing oversize fibreglass heads of world leaders – calling on them to wake up and make the necessary decisions to limit climate change. It was freezing cold, somehow a symbol of foreboding about the decision to come! Despite our concerns, there is still a sense that it’s possible to influence the outcome and make a difference. Deadlines for a final text are constantly moving and rumours vary wildly. Nothing is certain as the final days approach; however, we are encouraged by the changes in the text where we see signs that the below 2C text will be strengthened with an ambition for 1.5C – this is critical for the low lying atolls such as Kirabati and Tuvalu in the Pacific – and also the inclusion of loss and damage provisions, which will help vulnerable nations cope with the impacts of climate change to which they can’t adapt. 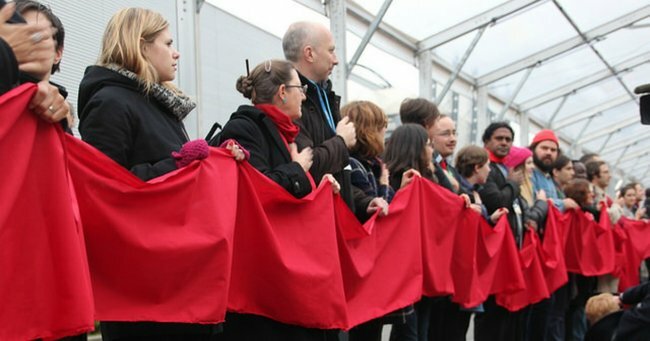 There is a real sense that the world is waking up on the challenge of cutting emissions. But the level of conviction is still to be tested. The intensity of the talks is scattered with lighter moments. There are sweeps as we guess the details of the final text, and competitions to see who has spent the longest at the negotiating table (One official reported being at the negotiation table until 7am). The first time that emotion really crept up on me and gave a palpable sense of what was at stake was when our partners held a poignant silent protest, stretching large red cloth from the ‘Champs-Elysees to the “Eiffel Tower’ (both sculptures in Le Bourget) to signify their red lines on any agreement – those things they’d find impossible to accept. I joined them and we stood, beating our hands on our chests to signify the heartbeats of the millions of vulnerable people across the globe. The conference centre was being dismantled, despite the fact a deal had not been reached. All we could do was wait. The French Foreign Minister and President Hollande made passionate pleas that an agreement must be reached. At 5:45 in the afternoon we watched the screens and waited. And waited, and waited. Finally, the Committee convened and with a fall of a gavel, it was sealed. We have a Paris agreement! There were cheers, hugs and many tears as the gavel fell on the final remarks. After the tireless work of literally tens of thousands of people in the halls of Le Bourget, and tens of thousands more across the world, it’s an incredible and historic day. Watch one of Oxfam’s educational videos on the effects of climate change below (post continues after video). It’s not perfect, and much more still needs to be done, but I hope the world now understands that we are all in this together. We should not underestimate that in such a volatile world, almost 200 countries came together in Paris to try to reach agreement on climate change. And they did. Governments, especially Australia, must step up and make it work, for everyone. As I prepare for the long trip back home, the challenge for all of us is only beginning.